What kind of thermostatic control does Home Thermostat allow? What kind of thermostatic control can I use with my climate system? Two-points valve (open/close), which can be controlled with 2 Points with Hysteresis or PI-PWM thermostat. In radiant floor systems, the thermostat control acts over the valves in the collector return, in the same way that it is done in radiators system. 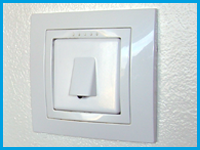 Thus, the same kinds of thermostatic control can be used for radiant floor valves. 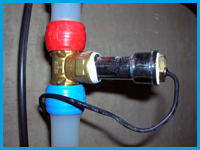 In a Fan Coil system, there are two elements to control: valves that allow the water flow through the pipes of the Fan Coil and the fan speed. If a thermostatic control over the valves is carried out, 2 Points with Hysteresis or PI-PWM controls can be used. If the thermostatic control should be applied over fan speed, PI-Continuous control will be the most suitable one. In zoning systems, a 2 Points with Hysteresis or PI-PWM control acts over the grilles of the different rooms and lets the air of the pump duct get into these rooms until the real temperature in each room reaches its corresponding setpoint. The PI thermostat demands heat/cool when the real temperature has already reached the setpoint or it does not demand heat/cool when setpoint has not been reached. K and T parameters should be configured according to the climate system that the thermostat is controlling. This way, the thermostat will have into account the thermal inertia of the climate system when calculating the control value. Cycle Time for PI control should be selected regarding the thermal inertia of the climate system. The higher the thermal inertia of the climate system is, the longer Cycle Time for PI the thermostat should have. If these parameters (K, T and Cycle Time) are not correctly selected, the climate system is not responding to thermostat control as expected. The climate system should be correctly dimensioned and there should not be an external source of heat/cool different that the climate system. Otherwise, the climate system response to thermostat heat/cool demand could not be the expected and, thus, the thermostat control can be influenced. For example: a heating system that is under-dimensioned (or it is well dimensioned but the window is open) will not heat as much as the thermostat expects regarding the K and T parameters. The thermostat will calculate a heat demand that the climate system cannot provide. Since the variation of the real temperature is lower than expected, the thermostat will increase the integral part and it will demand more heat. The result is that the climate system takes too long to reach the setpoint temperature and the real temperature will rise several degrees above the setpoint instead of maintaining this temperature. What is the range of Setpoint Temperature in Home thermostat? Zennio HomeThermostat admits Setpoint Temperatures between 0ºC and 95ºC. The KNX controller in installation sends relative Setpoint Temperatures, can I use Home Thermostat? El Termostato Home no permite establecer temperaturas de consigna relativas. How can I make the thermostat work in Freezing protection mode? Once the Freezing protection is enabled and the Protection temperature is set in ETS parameters, it works automatically. Whenever the real temperature (reference temperature ot the thermostat) is below the Freezing protection temperature, the Heating Control Variable is activated, regardless the thermostat is ON or OFF. For example: when the Freezing protection temperature is 10ºC, the thermostat will send 1 if thermostat is type 2 points with hysteresis or PI-PWM, or 100% if thermostat is PI-Continuous, through the object Heating Control Variable, regardless the thermostat is ON or OFF, whenever the real temperature is below 10ºC. How can I make the thermostat work in Overheating protection mode? Once the Overheating protection is enabled and the Protection temperature is set in ETS parameters, it works automatically. Whenever the real temperature (reference temperature ot the thermostat) is above the Overheating protection temperature, the Cooling Control Variable is active, regardless the thermostat is ON or OFF. For example: when the Overheating protection is 35ºC, the thermostat will send 1 if thermostat is type 2 points with hysteresis or PI-PWM, or 100% if thermostat is PI-Continuous, through the object Cooling Control Variable, regardless the thermostat is ON or OFF, whenever the real temperature is above 35ºC. What are the special modes? If the thermostat is ON, when a Special Mode is triggered, the setpoint temperature for this Special Mode is established as setpoint in thermostat. If the thermostat is OFF, the effect of a Special Mode trigger will depend on the selected parameter of Special Mode configuration in ETS: it turns the thermostat ON and changes the setpoint, it only changes the setpoint or it does not change anything. How could I know which Special Mode is active? In Home Thermostat, it is not possible, since the Special Modes are not Statuses, they are Events of setpoint change. What is the effect of a setpoint change when a Special Mode is active? In Home Thermostat, the setpoint changes and the thermostat gets out of the special mode. Could the setpoint temperatures of the Special Modes be sent to KNX Bus? When a Special Mode is set, the thermostat setpoint temperature will be updated with the corresponding setpoint of the Special Mode and the thermostat setpoint status will be sent to KNX bus. However, there are not communication objects associated to thesetpoints of the Special Modes, so they cannot be read. How can I select the default values of the setpoint of the Special Modes? In Home Thermostat, the setpoint temperatures of the Special Modes by default cannot be selected. How can I change the setpoint of a Special Mode? In Home Thermostat you can change the setpoint of a Special Modes in a dedicated page in Z38/Z38i (box 6 of Clima page have an arrow that leads you to this page) or through a communication object in the rest of devices with Home Thermostat. How can I synchronize the setpoint temperatures of a Special Mode in different thermostats? In Home Thermostat, synchronization of the setpoint of Special Modes for several devices (not Z38i) is possible through the communication objects for these setpoints. For Z38i, synchronization of setpoints of Special Modes is not possible, since it does not have such a communication object. What kind of thermostatic control does Building Thermostat allow? What is the range of Setpoint Temperature in Building Thermostat? Zennio Home Thermostat admits Setpoint Temperatures between -20ºC and 95ºC. Can the thermostat use the temperatures collected from two different temperature probes as reference temperature? Where (1) is the temperature collected from the temperature source 1 and (2) the temperature collected from the temperature source 2. The KNX controller in installation sends relative Setpoint Temperatures, can I use Zennio Thermostat? Zennio Building Thermostat allows relative setpoint temperatures, which sets a variation in the setpoint temperature of the active Special Mode, with an Offset. An absolute value of Offset (ºC) can be established with object [Tx]Setpoint Offset or Offset can be incremented or decremented 0.5ºC with [Tx]Setpoint Step. Once the setpoint temperature of the Protection Special Mode is set for Heating Mode in ETS parameters, it works automatically. Whenever the real temperature (reference temperature ot the thermostat) is below the Protection setpoint temperature for Heating Mode, the Heating Control Variable is activated, regardless the thermostat is ON or OFF. For example: when the Protection setpoint temperature in Heating Mode is 10ºC, the thermostat will send 1 if thermostat is type 2 points with hysteresis or PI-PWM, or 100% if thermostat is PI-Continuous, through the object Heating Control Variable, regardless the thermostat is ON or OFF, whenever the real temperature is below 10ºC. Once the setpoint temperature of the Protection Special Mode is set for Cooling Mode in ETS parameters, it works automatically. Whenever the real temperature (reference temperature ot the thermostat) is above the Protection setpoint temperature for Cooling Mode, the Cooling Control Variable is activated, regardless the thermostat is ON or OFF. For example: when the Protection Setpoint for Cooling Mode is 35ºC, the thermostat will send 1 if thermostat is type 2 points with hysteresis or PI-PWM, or 100% if thermostat is PI-Continuous, through the object Cooling Control Variable, regardless the thermostat is ON or OFF, whenever the real temperature is above 35ºC. In Zennio Building Thermostat, the Special Modes are Thermostat Statuses, so that the setpoint for the corresponding Special Mode is established as setpoint in thermostat, but this thermostat setpoint can be changed to fit the user needs. If it is enabled, the thermostat will turn on when a Special Mode is triggered. If it is disabled, the thermostat will remain OFF even if a Special Mode is triggered. In Building Thermostat, the active Special Mode can be known through a 1byte object of status [Tx] Special Mode Status. Absolute Setpoints: the special mode is maintained if the new setpoint is in the temperature band limited by other special modes setpoints. In case the new setpoint is above or below other special mode setpoint, this special mode is activated. Relative Setpoints: the thermostat setpoint is modified but the same Special Mode is maintained. If the setpoint change is due to a change in Basic Setpoint, all the setpoints of Special Modes will be modified. If the change is due to a change in Offset, it will affect to all the Special Modes only if the parameter “Permanently apply change to basic setpoint shift” is enabled. Otherwise, it will only affect to the currently active Special Mode. When a Special Mode is set, the thermostat setpoint temperature will be updated with the corresponding setpoint of the Special Mode and the thermostat setpoint status will be sent to KNX bus. However, there are not communication objects associated to the setpoints of the Special Modes, so they cannot be read. In Building Thermostat, the setpoint temperatures of the Special Modes by default can be selected in the thermostat parameters, with the absolute setpoint of Comfort Mode as a reference and the Offset of the rest of Special Modes. In Building Thermostat with absolute setpoint, the setpoint of the Special Modes can only be modified if “Permanently apply change to special mode setpoint” is enabled. In this case, before activating the new Special Mode, the current thermostat setpoint is stored as setpoint of the current Special Mode. The setpoint of the special modes can be reset to initial parameterized values, through the Setpoint Reset object. It is also important that the setpoints for Comfort mode cannot be stored if they are below the default setpoint for Comfort in Cooling mode or above the default setpoint for Comfort in Heating mode. In case “Permanently apply change to special mode setpoint” is disabled, a change in thermostat setpoint is kept until a change of Special mode, but it will not be stored. In Building Thermostat with relative Setpoints: the setpoints of Special Modes are established with an Offset of Special Mode with Basic Setpoint as reference. If this Basic Setpoint is modified, the setpoints of all the Special Modes will be altered in the same way. The setpoint temperature when a Special Mode is activated will be the default setpoint of the Special Mode in ETS configuration plus the variable Offset value, which is set through the communication object. This variable Offset will affect all the Special Modes if the parameter “Permanently apply change to basic setpoint shift” is enabled. Otherwise, it will only affect to the currently active Special Mode and it will reset (Offset=0) with the Special Mode change. The Offset value that can be added to default setpoint will be limited by upper and lower limits, defined in ETS parameterization. The Offset change affect to setpoint temperature of the Special Mode in the opposite working mode (Heating or Cooling), so that the automatic change of mode is carried out properly. In Building Thermostat with relative setpoints, all the thermostat should have the same parmeters for the offset of Special Modes. In case “Permanently apply change to basic setpoint shift” is enabled, the setpoint temperatures of the Special Modes can be synchronized with a central control of Basic Setpoint (with objects [Tx]Basic Setpoint) and Offset (with objects [Tx]Setpoint Offset). Otherwise, a central control of Reset (with objects [Tx] Offset Reset) would be needed to set the default Offsets. In Building Thermostat with absolute setpoints, all the thermostat should have the same parmeters for the setpoints of Special Modes. This way they can be synchronized to default values with objects [Tx]Setpoint Reset, that set de default setpoints. In Building Thermostat, values of setpoints of special modes have a limitation: Comfort, Standby and Economy setpoints should be established according to bands. In addition, the automatic change of mode is caused by variation of real temperature compared with setpoint temperatures of the current Special Mode in Heating and Cooling mode. This avoids undesired automatic changes of mode when a special mode or setpoint temperature changes. My thermostat always uses 25 ºC as the reference temperature. The Building thermostat module is independent of the device and it does not use the value measured by the internal temperature probe as the reference temperature by default. It is necessary to create one group address to link the “Temperature Source” object of the thermostat to the sending object of the internal temperature probe or other KNX probe.